Change the default device location: click on the map within the device to set the specified location. Manually assigning a location: enter your devices Lat and Long coordinates directly into the device. Within all devices, you may assign the position of your asset manually. In the bottom left-hand corner of your device data display, toggle the dropdown from "Auto" to "Manual". With a manual Location, you need only enter the GPS Coordinates of your desired location and Ubidots' maps will update automatically. Pro-tip: to easily locate your desired coordinates, use Google Maps to locate your position and pull the coordinates from the google URL. 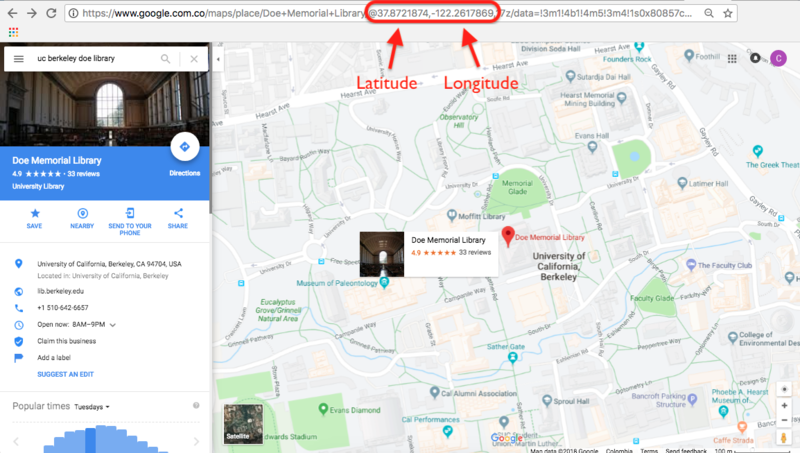 For example, here are the coordinates to UC Berkeley's Doe Library. 3. Sending a Variable called "Position"
As you can see above we set the coordinates into the structure; depending on the device and the code that you are working with, you can specify the coordinates obtained from your device into the structure for regular device location updates. With code similar to this, you will be sending the current device position as a "position" variable into your Ubidots account; keeping tabs on your device as it moves around the country or globe. Please reference to the Ubidots API Documentation for how to build the request message to POST data to Ubidots. Ubidots Forums also provide a helpful host of resources to sending an assets Lat and Long. With your variables reporting to Ubidots, you need only select the variable attached to the devices position and activate a widget. If you look to test how this context POST works on your Ubidots account, reference this post for our teams 3 favorite HTTP request simulators and build your request!